Looking for the best shaving creams? Using the right shaving cream is more important than you think. Unfortunately, picking the best shaving products for men isn’t easy, especially if you’re looking for a quality cream that isn’t loaded with chemicals and is good for sensitive skin. But finding a top men’s shaving cream that will get you the close shave you want without irritating your skin doesn’t have to result in you spending countless hours researching different types of brands. We understand the frustrations with shaving, and like all other experiences in life, not having the right tools can make the process more difficult. This is where using the highest-rated shave cream – the Taylor of Bond Street Sandalwood Shaving Cream – can make all the difference. In fact, maintaining a clean-shaven face on a daily basis can put some serious wear and tear on your facial hair and skin. And a good shaving cream can help you keep your face and skin sleek while moisturizing and conditioning no matter what type of razor you plan to use (e.g. double edge safety razor, disposable, straight razor, or cartridge). Because using the best men’s shaving cream is a vital part of any grooming routine, we invested the time to put together these reviews. From the dozens of shaving creams on the market, we narrowed our list to the top-rated brands and products, taking into consideration ingredients, ideal skin type, lubrication, scent, price and customer ratings. With so many different types to compare, we had to be thorough on our research. Our reviews will walk you through the top shaving products to help you get the quality shave you deserve. So whether you need a shave cream for sensitive skin, to use with a safety or straight razor, or a luxurious wet shave experience, this guide is for you! Taylor of Old Bond Street is a brand that needs no introduction. This company has been leading the industry since the mid-19th century, so they know a thing or two about high-quality shaving creams containing natural, skin-soothing ingredients. Taylor of Old Bond Street Sandalwood Shaving Cream is literally a step above the rest, and its tantalizing scent and rich lather is anything but mediocre. This is one of the best shaving creams for the sheer fact that it provides a luxurious, close shave every time. The most notable ingredient in this cream is glycerin, which works to moisturize and protect your skin. It has the texture of a rich lotion with a smooth, impeccable lather – and its sandalwood scent is masculine and inviting without overpowering. If the sandalwood smell doesn’t do it for you, there are a variety of different scents to choose from. This shaving cream also works well with any type of razor. From cartridge and disposable razors to straight and doubled-edged safety razors, guys will enjoy a consistently good trim without any cuts. 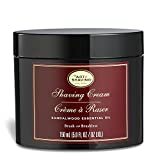 A 5.3-ounce container of the sandalwood shaving cream comes with a shaving bowl, allowing you to achieve the perfect lather and the smoothest shave effortlessly. 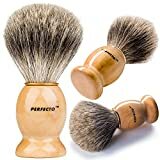 Although a little expensive compared to other products, thousands of 5-star customer reviews attest to its superiority when it comes to getting the best shave. If you shave regularly or want to spoil your face with a cream that allows a razor to glide across your face, then Taylor of Old Bond Street’s Sandalwood Shaving Cream takes the crown, hands-down. When it comes to producing the best shaving tools, the Art of Shaving is a leading contender. This brand’s name says it all – this company aims to create the closest, sleekest shave for all men. The Art of Shaving’s Sandalwood Shaving Cream provides a thick, foamy lather that moisturizes and protects your skin – two huge components when it comes to a classy, smooth shave. Are you a guy with sensitive skin? Want to kick razor burn to the curb once and for all? This product contains coconut oil, glycerin, and other essential oils that work together to smooth and soften even the driest skin. The sandalwood essential oil also incorporates a natural antiseptic agent that minimizes inflammation, helps to heal skin spots and even reduces the signs of aging. This is the best shaving cream for sensitive skin. Every time you pick up your razor, you’ll get a great shave without the irritation or cuts. Plus, it can be lathered up with a brush or your fingers so you can use it anywhere. Although this shaving product will cost you around $20 for a 5-ounce container – making it more expensive than other choices – it’s worth every penny and will last you several months. In the end, you get what you pay for when it comes to this top-rated shaving cream. If you need a way to rejuvenate your grooming routine while protecting your skin and facial hair, AoS is a good bet. Styling facial hair is an art-form, and The Art of Shaving will have your beard or stubble looking like a masterpiece. Shaving cream for men should provide ample lather and skin hydration, and Cremo Original Shave Cream brings smooth skin to the next level. The brand has dubbed their original shave cream “astonishingly superior” and guys everywhere have made it a wet shaving staple. This cream contains revolutionary shave technology that will guarantee a close, clean shave no matter your grooming habits. Cremo Original Shave Cream creates a thinner lather than traditional shaving creams, so no shave brush is needed to apply. The company argues that traditional creams create foamy lathers due to air pockets, resulting in areas where there is no lubrication and thereby increasing irritation and cuts. Instead, Cremo’s product is slicker and binds directly to your skin to achieve a super smooth shave. And with a concentrated formula that includes Aloe, Macadamia Seed oil, and a combination of Lemon, Papaya, Olive Leaf, and Calendula Extract, you can be sure this shaving cream really works to protect your skin. The Aloe Vera and essential oils will certainly moisturize to prevent flaky, dry skin. Plus, you end up with a light citrus scent that is subtle yet fragrant. Furthermore, while the Cremo Original is one of the cheapest shaving creams on our list, the product is made to last. Just an almond-size blob is enough for a complete shave with any of the best razors. This shaving product is filled to the brim with skin-enhancing extras, but it doesn’t come with a hefty price tag. So if you want an easy, smooth shave but don’t want some luxury product, Cremo Original Shave Cream is the best shaving cream for men on a budget. Proraso is a company that knows what goes into a good shave. This Italian shaving cream brand formulated the first pre-shave product in 1948, and they continue to product quality men’s grooming market. Proraso Shaving Cream has become a product known for its super-rich formula and undeniable ability to nurture your skin. The brand has actually developed a number of products, but the version we will be reviewing below is their general-use shaving cream. However, keep in mind that the company also manufactures shaving creams for sensitive skin as well as another especially focused on moisturizing and nourishing. If you’re new to wet shaving and want a versatile product, we recommend sticking to the green variation. The best shave cream soothes and protects skin, and this shaving cream from Proraso has all the makings of a skincare savior. It contains a combination of Eucalyptus Oil and Menthol, which work together to purify and refresh even the most sensitive male skin. Work this toning formula into a thick, soothing lather to obtain the smoothest shave while keeping any irritation at bay. When applying, you really do notice how much emphasis there is on making sure your razor glides across your face as the cream works to calm skin while raising facial hairs. It also helps that the ingredient list doesn’t include any parabens, silicones, artificial colors, or harsh chemicals. You can purchase a 2.5-pound tube of Proraso Shaving Cream for around $10, and this budget-friendly shaving staple is bound to last. All you need is a dime-sized amount to produce a generous lather for lubrication, and afterwards, you won’t notice any irritations or razor bumps. Coffee-enthusiasts rejoice: your caffeine habit doesn’t have to be limited to your morning cup. Pacific Shaving Company has served up a product all its own, and this shaving cream is sure to wake up your skin and have you ready to face the day. But how is caffeine good for your skin? Pacific Shaving Company’s Caffeinated Shaving Cream is an all-natural, unscented product that packs a huge skin-nourishing punch. Chock full of all-natural caffeine, this shave cream delivers antioxidants directly to your skin, alleviating redness, irritation and puffiness. But the caffeinated feature isn’t all this product has going for it. This shaving cream brand also contains other skin-boosting ingredients such as sunflower oil, shea butter, and aloe, which work to soften the skin without any harsh chemicals. The essential oils and hydrating butter are excellent moisturizes that will protect and nourish your face all day. The best part is that all of this company’s shaving cream ingredients are safe, natural (vegan) and organic. If you want the ultimate unscented cream made of the best ingredients, Pacific Shaving Company will have you feeling good about your grooming routine. And as one of the most affordable shave creams on our list, you can’t go wrong giving this company a chance. Taylor of Old Bond Street makes our list twice because the company’s Jermyn Street Luxury Shaving Cream for Sensitive Skin is another amazing tool to add to your grooming arsenal. 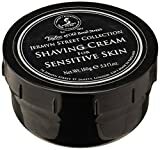 While the brand has many superior, worthwhile products we recommend you check out, the Jermyn Street Luxury cream protects and moisturizes better than most because it specifically caters to men who have sensitive skin that irritates easily. Sick of nicks, cuts, and razor burn from your daily shave? This popular shaving cream is allergen-free and has a light fragrance that won’t bother the skin. Hints of lemon, lime, and lavender over a base fragrance of musk and vanilla make this cream as tantalizing as it is skin-soothing. Moreover, Aloe vera leaf juice, glycerin, coconut acid, and patchouli oil work together to calm your skin’s problem areas and reduce the effects of aging, making this shaving cream a godsend for guys looking to protect their pores. Made to the highest quality standards in the industry, you can buy a container of this cream for around $15, making it a vital investment for men with sensitive skin who want to keep their facial hair under control without causing breakouts. If you’re Taylor of Old Bond Street Jermyn Street Luxury shaving cream is for men who take the quality of their skin – and a clean shave – very seriously. Billy Jealousy is a grooming brand that has been reportedly used by a number of bad boy celebrities. If a celebrity endorsement isn’t enough to reel you in, the company’s Hydroplane Super Slick Shave Cream literally does the work of three shaving products. If you’re willing to pay up for a top notch product, this could be the option for you! This 3-in-1 product combines pre-shave oil, shaving cream, and skin conditioner to really streamline your morning routine. Indulge your skin in a foamless lather that moisturizes for a smooth, effortless shave. Behind one of the best shaves you’ll ever experience is an ingredient called dimethicone – a water-based silicone that provides a slick barrier between the razor and your skin. The unique formula delivers a clean shave without skin damage, irritation, cuts, or burns. To use, just wet your face with warm water and spread onto your face with your hands. Because the cream goes on clear, you can actually see where you’ve shaved and how much facial hair is left. Furthermore, instead of heavy perfumes, chemicals or alcohols, Billy Jealousy products obtain their fragrance through natural fruit oils which also work to hydrate the skin. The ingredient list lacks any harsh chemicals, making it an excellent choice for guys with sensitive skin. Ultimately, this super slick, thick shaving product makes it easy to guide your razor along your face without the risk of cuts, for a precise shave every single time. And, unlike other shave creams, it won’t dry up. On the more expensive side at about $20 per bottle, this odorless cream is worth it. You won’t regret buying Billy Jealousy! Jack Black is another company that knows how to develop awesome men’s care products. Jack Black Beard Lube Conditioning Shave is another stellar cream that has the power of three grooming products in one, and it conditions facial hair and skin to make your morning shave a breeze. The Beard Lube acts as pre-shave oil, shaving cream, and conditioner, taking hydration to the next level. This men’s shaving cream doesn’t dry out your skin, but rather moisturizes and softens each hair follicle to allow the razor a seamless glide without the risk of irritation. The versatility and quality of this vegan product alone earns it a spot on our list. Made up of Macadamia nut oil, glycerin, and jojoba oil, this cream provides ample lubrication for a close shave on even the most sensitive skin. And don’t forget the unique formula that includes phospholipids, a rich source of essential fatty acids that hydrates the skin and develops a natural barrier to your razor. Additionally, guys will appreciate the light, lingering scent of peppermint and eucalyptus, and feel good about the fragrance-free, alcohol-free, vegan formula that is approved by dermatologists everywhere. As a very high quality shave cream, it’s ideal for shaving your face, sideburns or even your head. If you need a thick, transparent lube to see where you’re shaving or prefer a good blend of natural ingredients that won’t damage your skin, get this product for your grooming regimen. Choosing a good shaving cream goes beyond just finding an affordable product that smells great and says “for sensitive skin” (or whatever skin type you need). With numerous products and endless options available, knowing what will work best for your facial hair and skin is the place to start. If you’re serious about having the best shave experience, consider these factors before making your next purchase. Not all men’s shaving creams are created equal, especially when it comes to your specific skin type. If you have sensitive skin, don’t buy shaving creams that come with an astringent, as these may irritate your skin. However, men with oily skin may benefit from an astringent since it can reduce oil and prevent clogged pores. Finally, guys with dry skin should stick to a product with a glycerin base. Glycerin provides the skin with added moisture to avoid nicks and cuts while shaving. The ideal cream is free from toxic ingredients. Some chemicals to avoid include parabens, SLS, SLES, and certain fragrances. Parabens are common in the manufacture of many men’s grooming products because they prevent the growth of bacteria, but they are also linked to health conditions such as allergies and asthma. Sodium Lauryl Sulfate, also known as SLS, removes your skin’s natural oils, which can upset your complexion and lead to blemishes and irritation. SLES, also known as sodium laureth sulfate, can irritate sensitive skin. It is used to reduce the side effects of petroleum-based products on your skin and body, but can also lead to organ damage and toxicity. If you’re a guy with sensitive skin, you may want to shop around for an unscented shaving cream. The term “fragrance” can represent any one of 3,000 chemicals, many of which aren’t skin-friendly. Unless the brand claims “all-natural” or “organic” ingredients, be careful. The best shave cream nourishes and strengthens your skin instead of breaking it down and causing unnecessary irritation. Choosing a cream that contains almond and jojoba oils can help to soothe your skin and give you the perfect shave. Similarly, products that contain essentials oils such as lavender, sandalwood, and eucalyptus leave your skin feeling fresh and smelling amazing. Many experts stress that shave soap provides a more intense lather for a smoother shave but you have to put in a little more work to prepare the soap for a wet shave. Ultimately, shave soap is a bit more complicated, and it may take a few tries for you to determine how much water is needed for a perfect lather. If you want a close but quick shave in the mornings, we don’t suggest you try it. On the other hand, good shaving cream will lather up rather quickly since no water is required, making it perfect for a seamless, fast grooming routine. Unless you are dedicated to experiencing a really old-school wet shave with a straight or safety razor, we highly recommend you stick to creams or gels. Both shaving soap and cream come in scented and unscented varieties. If your skin is prone to breakouts and is sensitive to any irritants, you may want to forgo a shaving product that contains a scent. Fortunately, any creams we reviewed below have been researched for their quality ingredients and sensitivity, so any scented options on our list are safe bets. There are many advantages to using a good shaving brush. 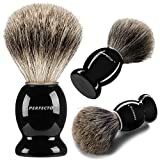 For starters, you can only achieve a truly rich lather with a shave brush. Also, when applying your shaving cream, the brush softens and lifts your facial hair for a closer, easier cut. Finally, the best shaving brushes gently exfoliate and remove dead skin cells, leaving your face feeling smooth and conditioned. If you’re going for quality, buying a top-rated shaving brush is worth the investment! You don’t have to look far for the best shaving creams. These top products are sure to meet your needs, no matter your skin type or facial hair texture. Obtaining a clean, smooth wet shave while keeping your skin moisturized and lubricated is key to grooming success. Get your hands on any one of these top-rated shave creams and you won’t regret the decision. And don’t forget to check out our list of recommended razors.